I just watched this move and then promptly fell asleep before my computer even finished booting up, so I hope you'll understand if this one's a little short! Especially after yesterday's movie, today's was great. A nice palate cleanser. Now, there are probably some obvious examples that I'm forgetting about, but have you ever seen an animated horror film? I never had, but I decided at the start of this project that I wanted to try and find one. I really enjoy animated movies, especially ones that are a little experimental. I especially like animation for adults, and I wish that there was more of it. Fear(s) of the Dark is hard to summarize, because it's an anthology film. Several different animators contributed segments, so there are a variety of styles on display, although all are in black and white. Each of the segments is about the subject of fear. Some of the segments recur throughout the movie. There really wasn't a bad one, but my favorite was the final one, a classic haunted house tale about a man who breaks into an old house for shelter against a storm. There was a moment that literally gave me goosebumps. When has that ever happened? 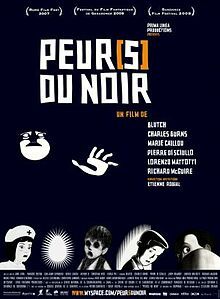 This movie is in French, and there are parts that are very... French. One of the recurring segments features abstract shapes and patterns morphing across the screen while a voice lists all the things that it's afraid of. The list includes things like mediocrity, shifts of personal philosophy, and the bourgeoisie. Oh, France... It's like you want to be pushed over and have your lunch money taken. A good one tonight. I give it four creepy bugs out of five.